Fantasy baseball owners love cheap starting pitching, especially when that pitcher comes with ace potential. While Chris Tillman’s days of being thought of as a frontline pitcher may be over, we probably have not seen the best of him. But we did see a few hints at the end of the 2012 season. 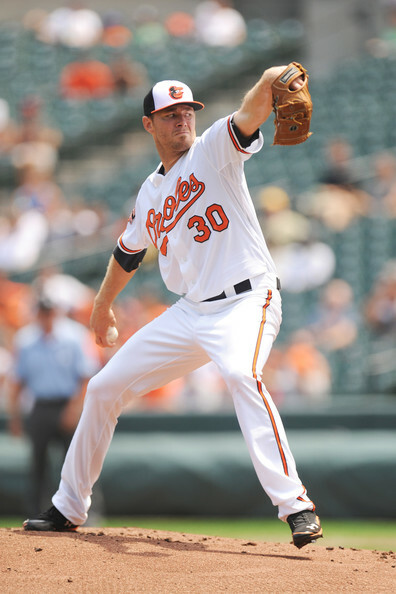 In Fantasy Baseball nothing is as intriguing as a sleeper and Chris Tillman is emerging as a nice one. Chris Tillman was drafted by the Seattle Mariners in the second round of the 2006 draft. He was one of their better prospects when he was traded along with Adam Jones and others to the Orioles for Erik Bedard. This was a trade the Mariners surely came to regret. Jones has become a regular in the Orioles lineup and is developing into a major star. Tillman was expected to lead the Orioles great group of pitching prospects into a bright future for Baltimore. That did not happen. Instead of success, Tillman went back and forth from the minors to the majors and back again. He was usually brilliant in the minors but got bombed after his call-ups. This pattern repeated itself throughout 2009 and 2010. It only got worse in 2011 when the velocity which had been at 95-plus MPH continued its decline into the 80s. He was now getting bombed just as bad in the minors and the majors. The experts were speculating that he was hiding an injury. Before the 2012 season the Orioles hired Rick Peterson as their director of pitching development. He would oversee the organization's pitching development program and introduce the organization to biomechanical analysis. "So when we have a lab in spring training, we get a guy in the bullpen at game speed and you have markers on him so the equipment will pick up angular measurements, linear measurements and rotational measurement. It's not video analysis, but you are getting true measurements of things like stride length, of external rotation, hip rotation velocities, the bend of knee at ball release…There are 40-some measurements in this testing. When you get the results back, you literally have the MRI of the pitching delivery. Then you can pinpoint very specifically, is there a flaw, No. 1, and if there is a flaw or flaws, is it mechanical, medical or conditioning? It's literally like ESPN's sports science for pitching." After a slow start to the 2012 season Tillman was scheduled to meet with Peterson in mid-May. They worked on adjusting some movement patterns so he could be clean to the pitching rubber. They fixed the path and timing of his leg kick and his hands so that he could stay on time and be in rhythm. This allowed Tillman to better repeat his delivery. He now had a more consistent release point and eventually his velocity started to rise again. "His throwing routine and his long-distance throwing, coupled with the ability to repeat his delivery," Peterson said. "We have seen this over the years with guys that have gone through this program. If you get a high-end velocity talent like Chris, and then you get the delivery clean, you start to see higher velocities and you see them maintained. (Miguel) Socolovich is a prime example and Miguel Gonzalez is an example of guys that have made these adjustments…If you looked at the delivery (of Tillman) prior to the ASMI analysis and look at it now, it is very apparent what the ASMI research has allowed us to identify to adjust." Soon his ERA had dropped and his confidence was back. He was called up to face the Seattle Mariners in July and was so pumped that he pitched in the mid-90s and even hit 97mph. While his velocity did not stay at that level he was back in the 91-94mph range and pitching effectively. His swinging strike rate jumped from under six percent in 2011 to 8.1 percent in 2012. An increasing Swinging Strike Rate is an excellent indicator of a coming increase in overall strikeout rate. Tillman was slowed a bit at the very end of the season by what was called right elbow stiffness. An MRI was performed which indicated his Ulnar Nerve was inflamed but the MRI did not show any damage. "I thought it was real good news," Orioles manager Buck Showalter said. "The exam, [team orthtopedist] Dr. Wilckens and the MRI showed the same thing, just some inflammation at the most. All the structure is good, the ligament everything. The ulnar nerve is a little imflamed, which is normal this time of year." Tillman finished the season with a 9-3 record and a 2.93 ERA in 86 innings pitched in the majors after 89.1 pitched in the minors. His half season was worth about $10-12 in a standard AL-only league. If you can get him for that price it would appear to have some profit potential. It may not be necessary. Early ADPs have Tillman going very late in drafts despite his recent resurgence. This may change a bit after the various expert sites release their magazines and draft guides. The Dynasty Guru (one of my new favorites and hopefully one of yours too) recently wrote an article comparing Tillman to another pitcher who seemed to get his mojo back in 2012. Check it out.